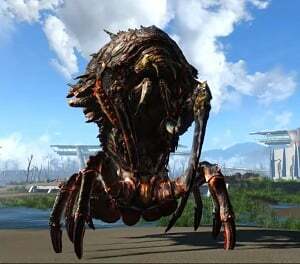 Fallout 76 Mirelurk Queens are giant, fast-moving creatures with somewhat range poison spit capabilities. Said range attack have volley capability. Another dangerous thing is their ability is to spawn small mirelurks to assist her in combat. Fallout 76 Mirelurk Queens is an Enemy in the game. Mirelurk Queens are the center of any mirelurk nest. They are the most precious member due to their ability to spawn young mirelurk and also its most dangerous defender. Enemies are creatures, robots and contraptions that are hostile to the player and may be defeated to complete Quests or obtain Loot. When fighting the Mirelurk Queen always remember that it will be a long exhausting fight. The spit volley capabilities keeps the player on the move all the time and large amounts of health and DR would require large amounts of ammo to perform damage. Enemies may have variants of their base form, each with its own set of resistances and possible loot. LvL 20 HP 2125 XP ?? - ?? RES 150 RES 100 RES ?? - ?? LvL 35 HP 2650 XP ?? - ?? LvL 50 HP 3725 XP ?? - ? ?